Now we talk about some great TDL Extensions, which work really greats with Tally.ERP9. 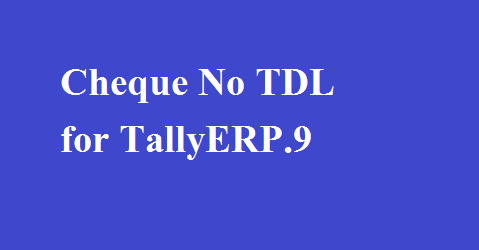 We already published a great TDL Function called Recycle Bin for Tally.ERP9. Now we talk on Cheque No. Tracking TDL with auto narration feature. This TDL is use for track the cheque details with automatic narration. But 1st we know about how to setup this TDL in Tally.ERP9.